There are days and there are weeks that sneak up on us to teach us lessons. There are moments, too, that make us pause in the traveling because we need to breathe in slow. Inhale the rest in order to recover from the chaos that piles up when we stop looking. This week has been one of those for me. A week of just being and letting myself settle into unplanned existing slow with my family. We have a week off of school, I needed this break from teaching and the kids needed the break from the studies. My husband has the week off of work, filled up with appointments that are not possible when his normal work routine is in process. One of my best friends is getting married this week, and friends, wedding plans tend to trump everything else.. And so… the words here have been quiet. But that is what I want to encourage you to embrace today… quiet…rest…refuge…safe. The blog post I had planned to write was going to talk to you about words and the way we choose them. However, this week as I was finding solace in the warmer temperatures outside, resting in the refuge and beauty of His creation that always amazes me, and finding release with a quiet walk I was surprised by a simple revelation my daughter taught me. We all need a safe place to take refuge and, conversely, we all also need to learn to be a safe place for those we love. This is one of the primary reasons I walk, friends, or try to as often as I can. I need the release of being one on one with God that getting out and away from everything provides. When my kids were little, it was the saving grace of my day. I needed the escape which let me bleed exhaustion without actually running away. I didn’t want to get away from the kids or the responsibilities, I just needed a quiet place of rest and refuge of safety. Walking provided both and kept me close enough if they needed me. Being needed and being safe are symbiotic roles we play in this life. Sometimes it is as a parent who is teaching, training, or leading. Sometimes it is as a spouse, sibling, or friend. Sometimes it is through prayer, but most of the time it is in the gentle but powerful act of listening. Actively walking frees my mind to just let go and let God move in and consume my soul. It is my prayer room, friends. Petitioning Him in His cathedral of beauty leads me to release life in reckless abandon. I guard this time as precious. My kids know this. Sometimes they walk with me, or once in a while one of them will ride their bikes while I walk or run. This time I spend moving the stress out from the inside in quiet submission to His sovereign will is something I covet and protect at all costs. I have an unwritten rule that talking to one another may possibly be limited or even not allowed. I know, that sounds so holy and kind, doesn’t it? “Don’t talk to me while I am walking and praying, please, because it keeps me on solid ground with Jesus and helps me be a momma and wife to these precious people I live with.” I am almost embarrassed to write that, but I have to be real here as I write to you, otherwise the words are mere words with no conviction, right? 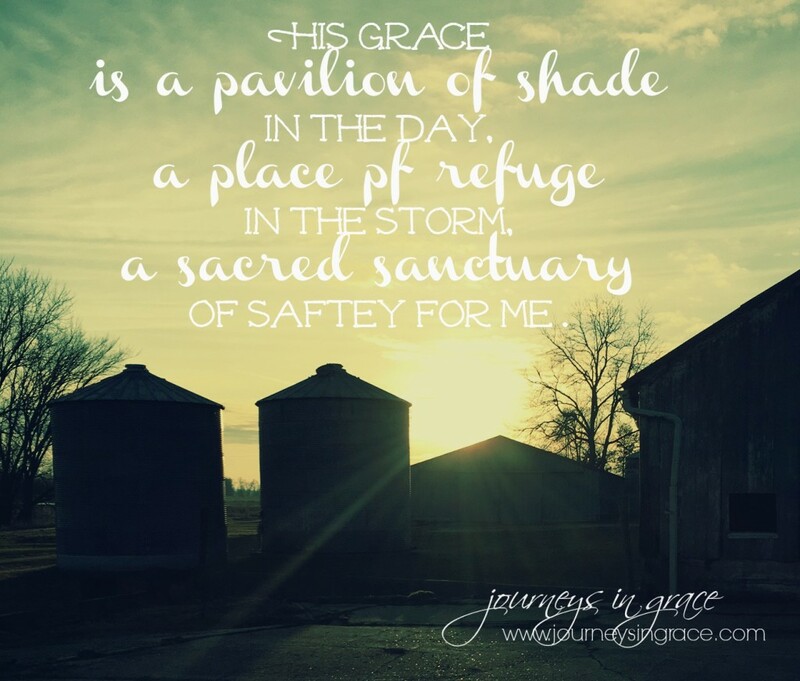 His GRACE is a pavilion of shade in the day, a place of refuge in the storm, a sacred sanctuary of safety for each of us who come under the shadow of His wings. This last week, my sweet girl came down to find me. She does that a lot when I am walking. Usually she is content to just lumber along with me, no words necessary. But there was something different. This was a seeking and it was a looking for an outlet to plug into, if you will. Not unlike her momma, who seeks solace in the counting of miles and the quiet of letting my mind turn off as I download into His grace. I need to connect to His mercy as often as possible. I need to meet with the Father and be filled with the Spirit and take in the Son. Like mother, like daughter…She needed to learn this lesson in passionate power-filled praying, and the glorious refuge of being shielded by love. Isaiah paints this word picture of God as our refuge so well. But God… in His Grace and Mercy opens up the blinded eye to see how grace is our best choice. And so she walked with me. Just as intent on the trodding a path with me. She knew there was a refuge in this prayer vigil. She had learned by watching me purpose to seek Him and then come back refreshed because I got away to pray. She has seen the fruit of His grace over my life. Sometimes I mess it all up with my words, friends. ( evidence as seen above), yet some of the best lessons are taught when our words are non-existent. As I was letting my heart release heaviness, I recognized it resting upon her. Ecclesiastes 4:9-10 came to mind, “Two are better than one; because they have a good reward for their labor. For if they fall, the one will lift up his fellow; but woe to him that is alone when he falls; for he has not another to help him up.” It only took an invitation to come into the place that grace already prepared for our hearts, friends. It took me looking outside of my busy and right into the heart of my child. Her words weren’t necessarily heavy, but she just wanted to connect… to reach out and wrestle with ideas and dreams, to know that even if her thoughts were silly or sober that she was safe to spill them with me. And don’t we all want a safe place to connect. To release. To fly in grace? To be a refuge, a safe place, a pavilion of shade, and a shelter from the storm is exactly who He is for us. It is who I want to be for my children and for those He has put in my life to love well because it opens the door to hope. And I come back to one word, Hope. Because hope is what we seek when we are looking for shelter, refuge, rest and quiet in our days. Hope is what we feel is lacking when we come into our prayer closets, looking for answers. Hope is what we feel may have dried up when the well has nothing left to fill or spill. In his grace and his favor, He meets us with the reward of His mercy and Hope and he links love right around it hedging us in and filling us up. He sends the rain and the sun and the wind and the storms all at the right time, but he also provides for us the ability to continue our journey through each trial and change because he leads us in the fullness of these truths. Release may just be one of the keys to the door of rest for us. I have been learning the power of RELEASE this year. Some of these lessons are just downright hard. But every single boulder that I learn to let out of that pack I carry, it is for my good and for His glory. This week, I learned to lay down self-preservation. I learned that being a safe place was just as important as finding a safe place. I learned that when I let Him lead me, see through His eyes, and be a hearer and a doer of His Word, that His Kingdom is near. As I continue to see His heart this Lenten season of letting go, I am continually in awe of each and every chance to soak up His graces. 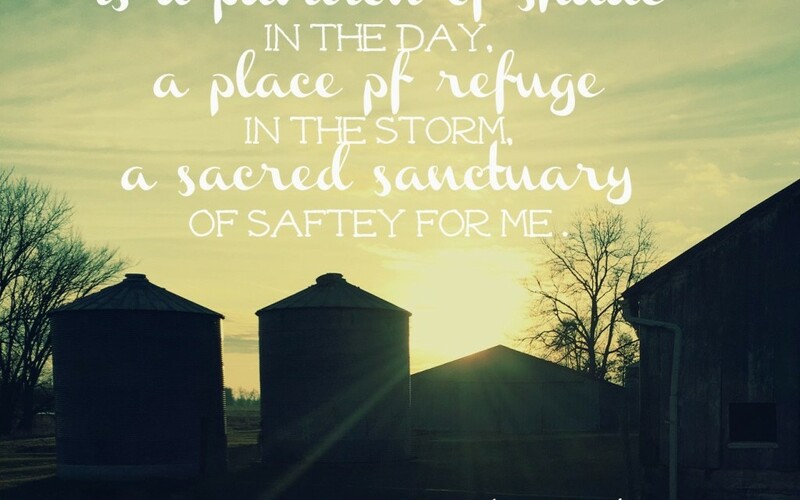 Praying for you to find a quietly restful refuge of safety today. Release is a great to learn. I love how you walk to spend time with God. So very important we love to take walks because whenever we are outdoors/ near nature I feel God all around me. I usually take my kiddos with me when I walk because they are still young. However when I drive to my families house, over 1 hour from our house…I really ask my kiddos not to talk because I love listening to worship music. I usually pray, cry, and sing while I drive. So important to just disconnect from everything and spend time with God. Thanks for sharing. You made a friendly stop by my blog and so I thought I would return the favor. The name of your blog alone was enough to draw me in, but I loved this post. You used the phrase “downloading grace” and I smiled. How often I find myself doing that! For me, solitary drives in the country are where I seek the extra “downloads” when I need them most. My husband knows my alone time is limited and when I tell him I need to go for a drive, he knows exactly what I mean, and he always encourages me to go. I’m so thankful for those opportunities to be alone with God and I never cease to be amazed at His willingness to meet with me there.